Made with love in the USA of leather, multi-chains and Celestial Crystal. Hand designed by Tammy. Vibrant Emerald Jeweled Cuff...Even more Radiant on!! 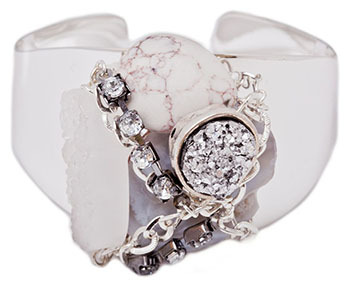 Made with love in the USA of Austrian Crystals, Semi-Precious Stones, Sterling Silver Plate, or 14K Filled Gold Plate. Hand designed by Tammy. 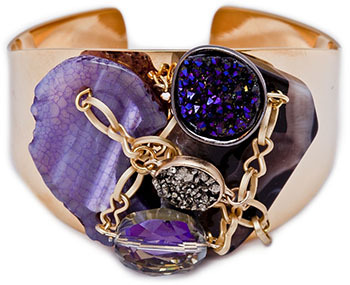 Heavy Metal never looked so Tough and Chic...The Obsess Cuff is easy to wear with a squeeze to fit adjustment. Made with love in the USA of Gold Metal and Oxidized Silver. Beautiful Golden Natural pallette of Stones...Squeeze to fit adjustment. Made with love in the USA of Austrian Crystals, Semi-Precious Stones, Czech Glass and 14K Gold Plate. Hand designed by Tammy. 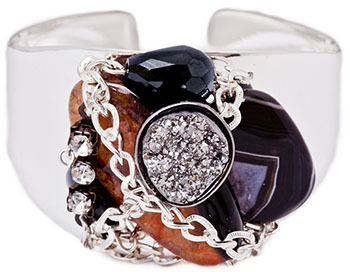 Rock the Noir Cuff... Made with love in the USA of Austrian Crystals, Semi-precious Stones, Czech Glass, Sterling Silver Plate, or 14K Filled Gold Plate. Hand designed by Tammy. Made with love in the USA of Austrian Crystals, Semi-Precious Stones, Czech Glass, Sterling Silver Plate, or 14K Filled Gold Plate. Hand designed by Tammy. Made with love of Brushed Metal. 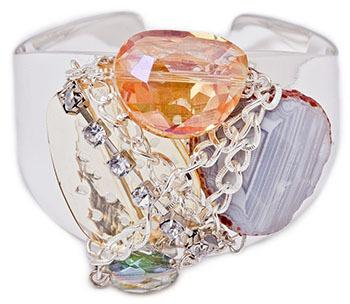 Beautiful and Bold the Capri Jeweled Cuff...Even more Fabulous on!! 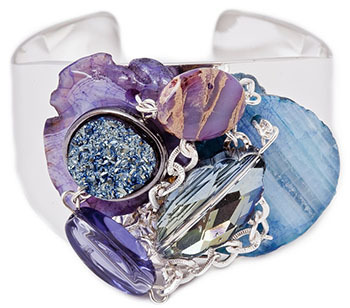 Made with love in the USA of Druzy Stone, Agate, Semi-Precious Stones, Sterling Silver Plate. Hand designed by Tammy. Beautiful and Bold Perfection... Made with love in the USA of Druzy Stone, Agate, Semi-precious Stones, Sterling Silver Plate, and 14K Filled plate. Hand designed by Tammy. The Malibu Cuff reminds us of a perfect Summer day... Made with love in the USA of Druzy Stone, Agate, Turquoise, Semi-Precious Stones, 14 K filled Gold Plate. hand designed by Tammy. Beautiful and Bold Perfection...Made with love in the USA of Druzy Stone, Agate, Semi-Precious Stones, and Sterling Silver Plate. Hand designed by Tammy. Vibrant, Beautiful and Bold... Made with love in the USA of Druzy Stone, Agate, Semi-Precious Stones, Sterling Silver Plate. Hand designed by Tammy. Beautiful, Fearless and Daring what a combo... Made with love in the USA of Druzy Stone, Agate, Semi-Precious Stones, and Sterling Silver Plate. hand designed by Tammy. Intricate Leaf details wraps your wrist creating a bold and beautiful look... Made with love of Sterling Silver Plate or 14K Gold Plate..